Aqueous geochemistry: water is the medium for transfer of ions and compounds through rocks and soil, and is basis for the hydrological cycle. Hydrogeologists commonly study the transport and fate of contaminants in ground water and surface waters. Marine geochemistry: seawater is a complex saline fluid with virtually every element in the periodic table occurring in a measurable concentration. Seawater interacts with oceanic lithosphere at divergent plate boundaries, and imparts a distinct chemical signature on that crust. Limestone and evaporite are marine sediments formed by biogenic (calcite-secreting organisms) and abiogenic processes (evaporation). Organic geochemistry: organic compounds in the earth system include petroleum, coal, dissolved organic compounds in ground water (natural and contaminants introduced by humans). The formation of these compounds reflect evidence of, and biomarkers in meteorites. Isotope geochemistry: all naturally occurring elements consist of a mix of (1) stable isotopes whose terrestrial abundance varies due to process such as melting, crystallization, and temperature dependent exchange; and (2) radioactive and radiogenic isotopes whose abundance varies due to radioactive decay as a function of time. The most common application of the latter isotopes is geochronology: the determination of the absolute age of rocks, sediments and geologic events, including the age of the earth and our solar system. Faculty in EES at UK who carry out research in the above disciplines include Alan Fryar (aqueous geochemistry), Dave Moecher (isotope geochemistry), and Kevin Yeager (isotope, marine, and organic geochemistry). Also see our Research Facilities web page for description of the analytical facilities in EES in which geochemical research is carried out. 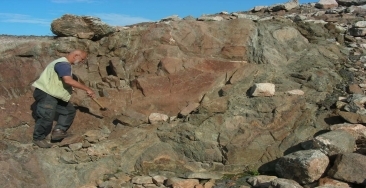 Professor Arild Andreson, University of Oslo, standing next to an outcrop of eclogite (red and green rocks), a remnant of subducted continental crust that was exhumed from mantle depths. Prof. Andreson accompanied UK Professor Dave Moecher and Gabriel RiCharde, a recent EES graduate student, on a field expedition to east Greenland in 2010. Gabe’s M.S. thesis research was based on the metamorphic petrology of the eclogite, which is used to reconstruct the tectonic history of the subducted crust. Petrology is simply the study of the mineralogy, textures, and chemical composition of igneous, sedimentary, and metamorphic rocks, including meteorites, but within the context of broader questions regarding the origin and evolution of the Earth’s crust and of the terrestrial planets. Kentucky is underlain by sedimentary rocks ranging in age from Ordovician to Pennsylvanian, and includes the full range of sedimentary rocks types. Faculty in EES (Frank Ettensohn, Mike McGlue, and Rebecca Freeman) and staff scientists of the Kentucky Geological Survey carry out research on shales and sandstones related to petroleum and coal formation, and on limestones comprising the majority of rocks exposed in central Kentucky. Meander bends of the Colorado River at Dead Horse Point, Utah, cutting into Mesozoic sandstones of the Colorado Plateau. The strata, mostly eolian and shallow marine sandstones, record the evolution of paleo-environments in the western U.S. Sandstones are a common petroleum reservoirs and groundwater aquifers because of their high porosity and permeability. 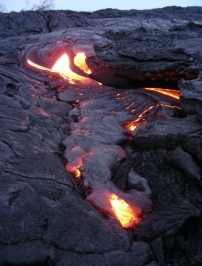 Active basalt lava flow, Kilauea, Hawaii. 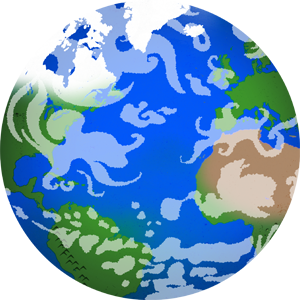 Igneous petrology deals in part with fundamental questions such as the origin of magma and what that tells us about the evolution of our planet. The huge amount of basalt erupted from Hawaiian volcanoes is interpreted to represent partial melting of a mantle plume or hotspot. Although igneous and metamorphic rocks can be found just 3 km beneath the Paleozoic strata in Kentucky, the nearest outcrops are in the Great Smoky Mountains in western North Carolina. See Dave Moecher’s research statement for specific projects that he and his students work on in western North Carolina, and New England.